Return to base warranties are the most basic and the most common. In the event of a problem, the projector needs to be returned to the local service centre. It will be repaired, usually within two weeks, and then sent back to you. Some manufacturers are quicker to make repairs, but the turnaround time is always subject to stock of the relevant spare parts. If they're out of stock, it can take an indefinite amount of time to make a repair. For this reason, we recommend that if you rely on your projector you should purchase a warranty upgrade if an option with the projector you are looking at. In the event of a problem, the projector will be collected from you, repaired and then returned to you. Some manufacturers are quicker to make repairs, but the turnaround time is always subject to stock of the relevant spare parts. If they're out of stock, it can take an indefinite amount of time to make a repair. 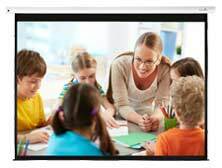 If you have a projector problem that cannot be resolved over the phone, a replacement projector will be despatched to you and your projector will be collected. You retain the replacement projector. This is nearly always carried out on a next working day basis, although sometimes it is subject to stock of replacement projectors of a similar specification. An average warranty is two years, although as projectors become more reliable, more and more manufacturers are offering three year warranties. If your projector comes with less than a three year warranty as standard, it can normally be extended to three or four years, or a 'return to base' warranty can be replaced with a warranty that offers a better service level. To see the options available, see the detailed projector summaries in the Buy section. As far as we are aware, none of the manufacturers' projector warranties will cover the lamps and cables for whole of the warranty period. Lamps normally come with a 60 or 90 day warranty, as they are subject to knock damage. Please contact us if you would like information on a specific manufacturer's policy on lamps. Warranties do not cover damage from physical knocks. They basically cover the components of the projector (apart from the lamp and cables) from physical defects. If you report a fault with a projector within the first seven days of it arriving, a replacement will be despatched to you. With some projectors the faulty unit needs to be collected before the new unit is despatched. We hope the above warranty guide has given you a clear understanding of the basics in what to look out for. We understand there is a lot to take in and a lot of choice so if you still need help we're only a phone call or email away.